On Monday September 18th, the Ipswich High School Interact Club sponsored the weekly Dinner Bell at the Masonic Temple. 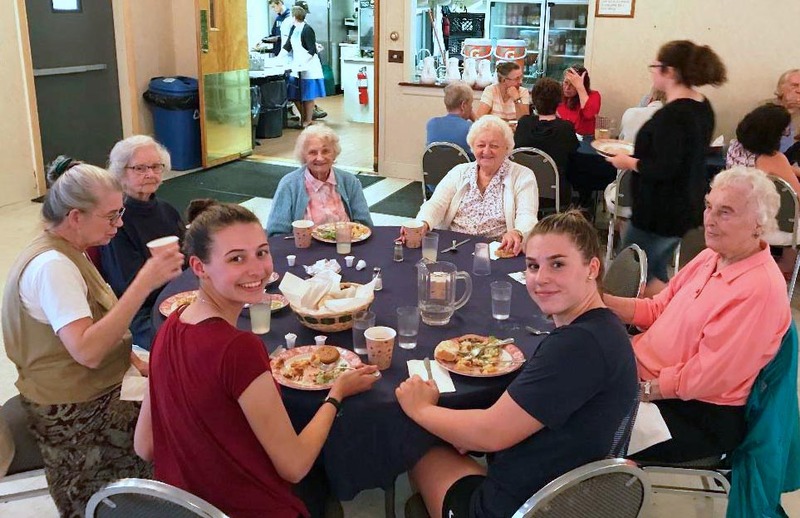 Working with a team of weekly Dinner Bell volunteers and some Ipswich Rotarians, seven high school students served dinner to over one hundred community members. The Interact students had a fantastic time serving and meeting the attendees, and in between refilling coffee cups and clearing dirty dishes. Many interesting stories were exchanged and some new connections were made. Many thanks to all the volunteers who made the evening a smashing and delicious success! Pictured with a few of the diners are Interact students Martha Rand and Ellie O’Donnell.